Feta Basil Dip | Om nom nom! So this was pretty much delicious. And ridiculously easy. I made this as a dip for apps before dinner with my Mom, and we all gave it two thumbs up. 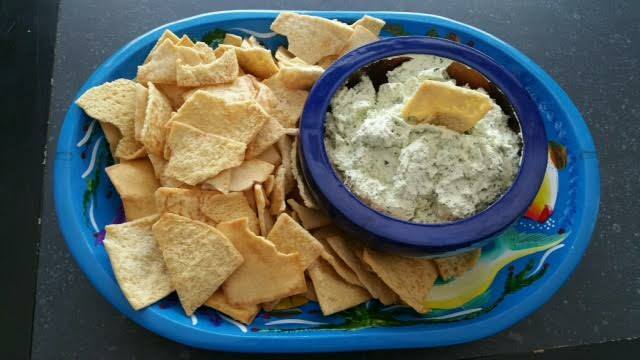 Found this on a Buzzfeed listing of best dips, of all places, and it came from a blog called Domestic Superhero. This would be great to bring to a picnic, and it’s best if you can let it chill overnight, but a couple of hours would do. Serve it at room temperature. If using a block of feta, first place it in the food processor and pulse to crumble. Next add the cream cheese, basil, and garlic and process on high for 1 minute or until creamy and smooth. Add wine, salt and pepper and combine for a few more seconds until nice and smooth. Remove from processor bowl and place in an air-tight container in the fridge. Refrigerate at least 1 hour, but the longer the better (overnight if possible before a party). Serve with toasted baguette slices, vegetable slices, pita chips, anything you like. It is a thick dip though, so something sturdy would be best.